Q: This photograph portrays my great-aunt, Mary Jane Matches, who died in 1921. I am wondering about the date of this photo and therefore her age when it was taken. The child is not her daughter. A: This professional studio photograph is a fine fashion image that can be closely and accurately dated from your great aunt’s stylish appearance. As was usual for a formal photographic portrait sitting, both she and her young companion are well-dressed in what would have been their best quality, most up-to-date outfits. Mary looks very slender in a fitted suit tailored in checked winter-weight fabric, her skirt fashioned in the narrow, low-calf or ankle-length style known as the ‘hobble’ skirt – a mode fashionable for just a few years, between 1911 and 1914. The skirt worn here is a practical version, wide enough for an ordinary woman who needed to get about on foot, but high fashion dictated an even tighter ‘hobble’ skirt - an extreme style that certainly impeded walking, as seen, for example, in photographs of society ladies at Ascot in the pre-WW1 era. Beneath the smart but functional suit, your great aunt wears a white blouse with a small collar, a style characteristic of the early-1910s, once the high Edwardian choker-like collar had become outmoded. She wears the fashionable laced shoes that were just beginning to supersede traditional leather boots. Her feathered felt hat displays the moderate brim most typical of c.1913-15, in between the vast ‘Titanic-era’ headwear of 1910-12 and the wider hats that returned in around 1916. Perhaps most prominent of all, dress-wise, are her fur accessories – a long stole draped over her shoulders and a matching hand muff. As far as I can tell from the animal masks (heads) and tails, these articles may be fashioned from several fox skins. Fox would later become the most popular fur of the inter-war era, when many women owned a fox fur stole or cape. However, here is a relatively early sighting in a photograph of this date: at this point in time, fur – previously a luxury status symbol confined mainly to the affluent classes - was just beginning to be adopted more widely throughout society and would become increasingly common during the First World War. 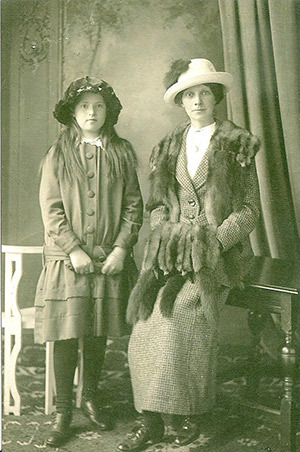 The girl posing with your great aunt looks to be aged about eleven to fourteen, or thereabouts, and is well-dressed in a suitably adolescent manner. Her buttoned coat-dress, dark stockings and large velvet hat accord well with a date in the early 1910s, her knee-length garment correct for a school-age girl at that time. The warm, substantial nature of both Mary’s and the girl’s clothing and accessories strongly implies that the season is cool, so I would hazard a guess that the month of this photograph is likely to be somewhere between November and April. Special studio photographs such as this were nearly always taken to mark a special occasion and in view of the 1911-14 (especially 1913 or 1914) date range, I would suggest that it may well have been prompted by your great aunt’s 30th birthday in 1914, especially if her birth date fell in winter or spring. Alternatively, the presence of the girl may be relevant to the photograph: you say that she is not a daughter, but it would be interesting to pin down her identity and establish her relationship to Mary. With a firm time frame for the photograph, hopefully more will now become clear.